Whether you’re doing a basic Google image search or a Google advanced image search, this is one of the most common activities done online, but have you ever made someone mad by using an image you found in Google ? Yes, I’ve used Google images search and grabbed photos and used them for a document online. Yes, I’ve used Google Images search and didn’t think about whether I could use the picture or not. It’s not like it really matters right ? It’s a public image search engine. Yes, I’ve used Google Images search and I know I’m supposed to give image attribution to the owner, but I don’t because I’ve never gotten into trouble. Yes, I’ve used Google Images but I always give attribution to where it came from and to the owner. When we talk about image attribution, we’re just talking about where the image came from. This applies even when the image is your own, but especially when the image is not. If you don’t own the image, you should always operate under the mindset that you’re required to give credit to the person the image belongs to regardless of where you acquired the image from. This is applicable when you’re copying an image from a person’s website and when you’re grabbing it from an image search engine like Google. With that said, here’s what we know about images and imagery.. it’s absolutely necessary that you utilize this in your content and that you want to see it in others. However, in spite of this reality, most of us that have been blogging for a while know that on one hand image visuals can do wonders and produce an amazing outcome for you. On the other hand, images can get you into trouble if you aren’t aware of the rules and how to navigate the use of them appropriately and respectfully. In one particular situation that I experienced myself years ago in one of the websites that I owned mirrors exactly what I’m talking about in using images correctly. I’ll briefly share that story with you now. My story is this… It was in the early days of my website experiences and needless to say I didn’t know anything about having a content site but I was learning along the way like most of us do. It was all new to me but whether you’re online or offline we don’t always remember that rules don’t change. With that said, unfortunately when things are new to us, we can jump into it face first, feet and hands.. all in and just run with it and that’s exactly what I did. I was focused on the success of the website and in my excitement I didn’t do enough research to learn the in’s and out’s of owning a website and adding media to it that wasn’t my own. I’ll be the first to say, wow that was dumb. As I continued to build up the website, add content and add images.. everyday Google images was my best friend and I’d go there and perform my searches and grab the images and add them to my website and things were running along smoothly and that was great ! Traffic was coming in and the website started to pick up traction and visibility. I thought this was awesome because again I was pretty new at this at the time. People started to interact with me and I started getting feedback until that one inevitable and heart dropping day when I received a cease and desist letter because I was claiming other people’s images as my own. Talk about a hard lesson to learn. In that letter I was told that I had 24 hours to remove every image that belonged to the website owner that found their images on my website. It’s worthwhile to note that by the time I had received this letter, I had a pretty decent amount of content on my website. I quickly realized the weight of what I had done to this website owner, how I had represented myself in doing this and what I had to do. I then proceeded to profusely apologize by email to the owner of the images and within the 24 hour window removed every image on my website since they had all been acquired from Google Images. So without question, I took the letter seriously and there was no doubt in my mind that I went about this all wrong in how I acquired images for my website. It was a tough personal experience, but as a newbie to all of this, it was an extremely valuable lesson to learn in regards to understanding that just because you have access to an image search engine doesn’t mean that you can just take the images and claim them on your website without proper attribution and it opened the door to start to learn about different licenses associated with images too. Now you may be wondering, well what did you do after that ? At this point, I had a website with no images at all so it looked bland, unappealing and was just simply an eye sore to my visitors, but again.. it was my fault and I was looking for a solution. So I did some reading and learned about royalty free images, creative commons images and public domain images. It was during this time that I started to learn and gain a lot of insight about the importance of non copyright images and not just taking a photo and slapping it on your website and calling it your own. I’m still not perfect by any means but I do a much better job these days in terms of how I use images today, especially on this blog. My new home became places like istockphoto.com, depositphotos.com, 123rf.com and make no mistake about it, between finding a mix comprised of free and in other cases what was affordable to me (which yes, it meant I paid out of pocket for some images too) stock and creative common images as well. Nevertheless, in retrospect, this was definitely more difficult to do years ago than it is now, however this was the path I had to take to right the wrong I had engaged in that led to the letter requiring the removal of images on my website. With that said, assuming that there are some of you that are reading this that may have the same concerns about how you’re using Google Images or may have had a similar experience, I’ll show you how to engage Google images to access their advanced image search features to find images that you can use as an a route to acquiring images to use in your content appropriately free of copyright and misuse type of concerns. 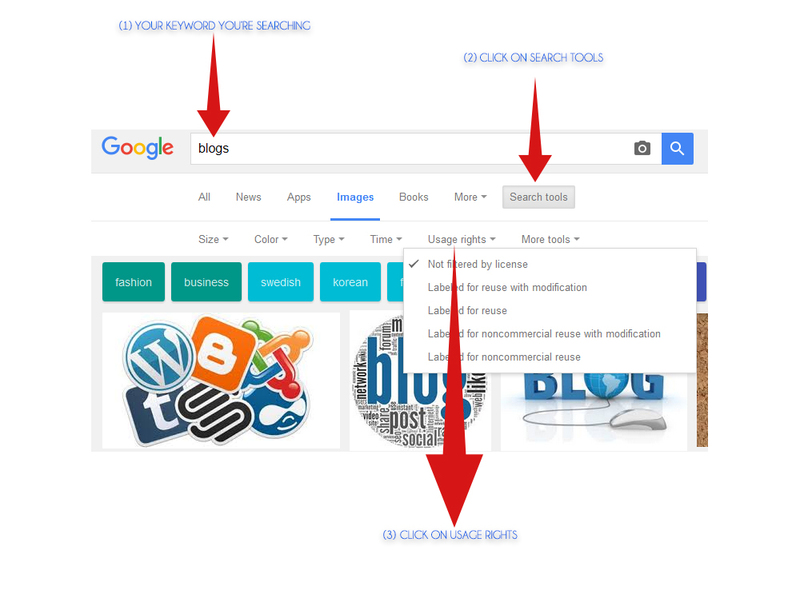 As you see in the image, as noted in the 3 step process, Google has updated their searching process so that finding images that are free to use is much less stress and time involved on the user as possible. It's as simple as pointing and clicking if you know where to go. In closing, using this process will steer you clear from the type of experience I encountered in my early days of developing websites and content. However, for those that don't want to use this process, the alternative is paying for your images or creating your own. The only downside to paying for your images is paying but the upsides are endless especially when you consider the sheer quality and access to images that you'll have. With that said, here are my recommendations as I've used all of them personally. Istockphoto.com - My #1 recommendations. Quality thoroughly represents this website no regardless of the image that you're looking for. The options are very comprehensive and if you're looking for images, the only thing that limits you is your wallet. Depositphotos.com - My #2 recommendation. Great reputation, high quality images, and very good database of images for your needs. If you start here and don't find what you need, you are more than likely going to find it with the first recommendation, but once again, this needs to be part of your toolkit for stock imagery. 123rf.com - My #3 recommendation and without question a high quality stock image website to find images that you can call your own. Pricing is competitive and you don't have to break the bank to find images to fit the content you're getting ready to publish online. You'll be happy with this option as well. Canva.com - My last recommendation and this place among others I have used is a fun place to go to create your own image. Not a big learning curve and you'll be happy with the results. However, while the work that you do can be done for free, you're likely going to spend a few bucks here too, but don't shy away from any of the recommendations because it's not completely free. The reality is that you get what you pay for and just as competitive as content, blogging and getting information out to the masses is becoming, make no mistake that quality will set you apart and all 4 of these recommendations will give you that added push in your content to compete with others that are doing the same thing you are.